Sen. Jim DeMint Leaving Congress To Run Heritage Foundation : The Two-Way He's one of the most consistently conservative voices in Congress and a favorite of Tea Party activists across the nation. DeMint says he's "not leaving the fight." No organization, he says, is better equipped to push conservative principles than Heritage, a Washington-based think tank. One of the most consistently conservative voices in Congress and a favorite of Tea Party activists across the nation is leaving the Senate. 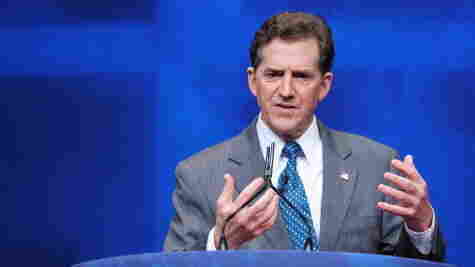 South Carolina Republican Jim DeMint is resigning to take over as president of the Heritage Foundation. The foundation says "Heritage's Board of Trustees unanimously chose DeMint as the organization's next leader, starting April 3. DeMint will resign from the Senate and start as president-elect in early January." He replaces "Edwin J. Feulner, the man who first envisioned the think tank in 1973 and has led it as president for the past 36 years." "I'm leaving the Senate now, but I'm not leaving the fight. I've decided to join The Heritage Foundation at a time when the conservative movement needs strong leadership in the battle of ideas. No organization is better equipped to lead this fight and I believe my experience in public office as well as in the private sector as a business owner will help Heritage become even more effective in the years to come." The Wall Street Journal, one of the outlets that broke the news, notes that "Sen. DeMint's departure means that South Carolina Governor Nikki Haley, a Republican, will name a successor, who will have to run in a special election in 2014. In that year, both Mr. DeMint's replacement and Sen. Lindsey Graham will be running for reelection in South Carolina. Mr. DeMint was reelected to a second term in 2010. The 61-year-old senator had announced earlier that he would not seek a third term." Update at 2 p.m. ET. Rep. Tim Scott? On a more serious note than our update about @colbertforsc, The Hill reports being told by "two state Republican sources" that DeMint wants Gov. Haley to name Rep. Tim Scott, R-S.C., to take the Senate seat. Update at 11:50 a.m. ET. Stephen Colbert? Someone's already created @colbertforsc on Twitter and grabbed the "Colbert for Senate" url. Comedy Central's Stephen Colbert has, after all, previously run for "president of South Carolina." Let the fun begin.